Before arriving at your tap, drinking water is treated at water treatment plant to remove sediment, bacteria, and other impurities. Once the water arrives at the plant, the pH is adjusted and water is rapidly mixed with aluminum sulfate (alum), a coagulant that helps the impurities stick together to form bigger particles called floc. This rapidly mixing is produces by Pulsair mixing tank systems. 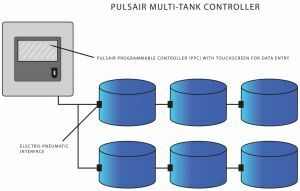 Pulsair design and adjust tank mixers to any tank size. 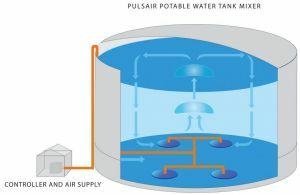 One of the features many water utility operators like about Pulsair is the fact there is zero in-tank maintenance. Since there are no moving parts inside the water storage tank. With Pulsair liquid mixing machine, there is no need to take the tank off-line in order to service or maintain the equipment. Anytime you are putting an electric motor near or underwater, some sort of issues are bound to rise up – not true with Pulsair. Pulsair Systems is the world leader in compressed air, large bubble mixing. This energy efficient liquid mixing process is fast, powerful and requires less maintenance than traditional mixing methods. Heating an IBC tote tank? – Speed up the heating process with a Pulsair tote mixer.